The new inferometers do not require a coherent light source meaning they can easily be miniturised and do not have to be used in a lab environment. They could be used as biosensors, capable of conducting a complete blood workup using a single drop, or hand-held environmental sensors capable of instantly and simultaneously testing water for pesticides, E. coli and lead. Nanoscale plasmonic interferometry is a method that integrates the fields of nanotechnology and plasmonics by manipulating the interaction between light and the electrons in metals. Researchers from Brown University’s School of Engineering developed the method, which does not require specialized external light sources to provide coherent light. This breakthrough could help in the development of more compact and versatile devices. 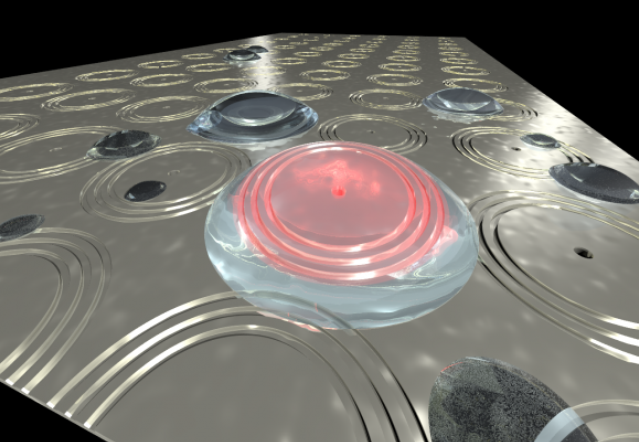 It has always been assumed that coherent light was necessary for plasmonic interferometry. But we were able to disprove that assumption. Plasmonic interferometers use the interaction between light and surface plasmon polaritons (density waves formed when light interferes with the free electrons of a metal). The interferometer developed resembles the structure of a bull’s-eye engraved in a thin metal layer. A hole with a diameter of 300 nm is made at the center surrounded by a series of micrometer-sized groves etched in the metal layer. It is possible to place thousands of these small bulls-eyes on a fingernail-sized chip. When an interferometer’s surface is exposed to light from an external source some of the photons pass through the central hole and the grooves scatter the remaining photons. Surface plasmons are generated by the scattered photons and propagated through the metal towards the hole. This results in interactions between the exiting and incoming photons to produce an interference pattern in the light released from the hole. A detector placed under the metal surface then detects this pattern. The deposition of a liquid over an interferometer causes the surface plasmons and the light to propagate through it before they interact; creating different interference patterns based on the chemical composition of the liquid or the elements present in it. Groove rings of varied sizes can be used around the hole to adjust the interferometer in order to identify the signature of particular molecule or compound. A versatile detector can be developed by placing a number of differently tuned interferometers on to a single chip. Until now all plasmonic interferometers have had to use highly specialized external light sources as the light source has had to be coherent. Coherent light contains waves which are all in phase with each other, i.e. the valleys and peaks of the waves are both aligned. Interferometers require a coherent light source in order to generate useful interference patterns. However, these coherent light sources are expensive and bulky, and they require accurate alignment and regular recalibration to acquire a reliable optical response. The new method developed by Pacifici and his team does not require external coherent light sources due to the direct integration of fluorescent light-emitting atoms into the hole at the center of the interferometer. However, it still needs an external light source to excite the internal emitters. This is a whole new concept for optical interferometry, an entirely new device. The embedded light emitters remove the need to control the quantity of the liquid sample introduced on the surface of the interferometer. Large liquid droplets can develop lensing effects, which can introduce error into experimental results as the lights coherence is negatively effected. To solve this problem microfluidic channels are often needed; however the nature of the new inferometer means this won't be necessary as the lights coherence does not matter. Additional work is needed to realize the practical application of this new device and Pacifici and his group plan to continue with their efforts to improve the idea. Eliminating the external light source completely will be the next task of the researchers. The team feels that it could be possible to use electric current or small fiber optic lines to excite the internal emitters.